Nicholson Yacht Charters is the Oldest Established Yacht Charter Company in the World – and We’re Still First! The Story of Nicholson Yacht Charters is about being in the right place at the right time. It all started when Commander V.E.B. Nicholson, O.B.E. left England in 1949 with his wife, Emmy, and two sons, Desmond and Rodney on their 70′ classic schooner, Mollihawk and met Julie Pyle, who had just sailed around the world on the 93′ Brigantine, Yankee. Julie married Rodney and settled in Antigua and opened up Nicholson Yacht Charters, which at the time had its own fleet and retailed charters to guests staying at the Mill Reef Club. Pan American distributed Nicholson Yacht Charters brochures to travel agents in the United States. Those travel agents became brokers, who retailed Nicholson’s charters to their clients, and the Nicholson ‘clearing house’ was born. Because those agents needed to inspect yachts for charter, the annual Nicholson Charter Yacht Show was started. Sylvia Weston came aboard in 1963. These four, now supported by a small but fine fleet of classic yachts, made it possible for companies like Camper & Nicholson and Northrop and Johnson, architects and brokerage firms, to open up yacht charter departments, because the Nicholson family was in the Caribbean to streamline operations. The business soon grew, and an industry was born. Today, Nicholson Yacht Charters is still a family business with offices in Maine and Massachusetts and takes pride in offering the most satisfying and luxurious yachting experience possible to guests. No other charter company knows the craft and the cruising grounds as well as Nicholson Yacht Charter’s caring, experienced staff. We select only the most qualified and congenial crews and help you choose the yacht that is exactly right for you and your group. We help you plan every detail of your charter vacation. The purpose of the charter broker is to add value; to provide expert, trusted advice and information; to supply “fun.” And the fun begins the minute you call us! Julie Pyle Nicholson graduated from Emma Willard School and Smith College. She sailed around the world on the 96’ Brigantine Yankee with Irving and Exy Johnson in 1954. Assistant editor for the Boston Herald American, Julie met and married Rodney Nicholson in Antigua in 1954 and has worked to promote Nicholson Yacht Charters since 1954. 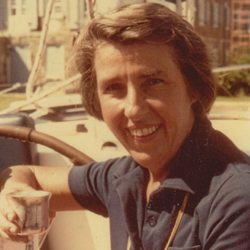 Selling to the public, travel agents and charter brokers for over 50 years, she pioneered the Nicholson Charter Yacht Show (now called the Antigua Yacht Meeting). She created Nicholson Yacht Charter’s clearing house and moved to Massachusetts in 1973. She recently expanded that operation to Maine in 2008. Prior to that, she and her colleague Sylvia Weston worked together in St. Johns, Antigua until 1973. These two have worked as a team for many years and love the yacht chartering industry. 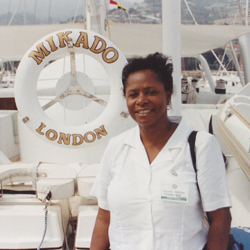 Born in Antigua, Sylvia Weston began her yachting career at Nicholson Yacht Charters in 1963 and is well known and respected in the industry. She was educated at Princess Margaret School in Antigua and graduated from Harvard Extension School. 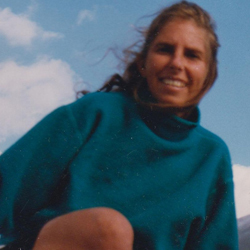 Sylvia loves yachting, and was baptized into the business by her first remarkable sailing experience. Sylvia seems to know the importance of crew when placing clients on the yacht that is exactly right for them. Knowing her boats, the crew and the cruising grounds, she travels extensively to view the yachts and sample the cruising areas. She has a special knack for placing guests with the right yacht and crew and provides superb service, attends to details and has a wonderfully personal touch. Her primary goal is to make sure that guests have a leisurely, fun, relaxed and enjoyable time on their yacht cruise vacation. Shelby Nicholson was born in Antigua in 1959 and was educated at boarding schools in Connecticut through the 70s. She graduated from Choate Rosemary Hall in 1978 and later from Harvard Extension School in 1999. She enjoys music, traveling, sailing, is an expert windsurfer, and has cooked on charter yachts in the Mediterranean, Caribbean and Virgin Islands. Shelby has sailed many seas including the Panama Canal, Tahiti and Turkey. She started working for Nicholson Yacht Charters in 1979. Shelby knows the Caribbean well and loves the West Indian culture, and she is also a big fan of the Mediterranean Sea and South Pacific.